He who laughs last, laughs best, after reading IB’s response on her facebook wall to madam Clarion Chukwurah, I giggled and said that’s my gurl!!!! 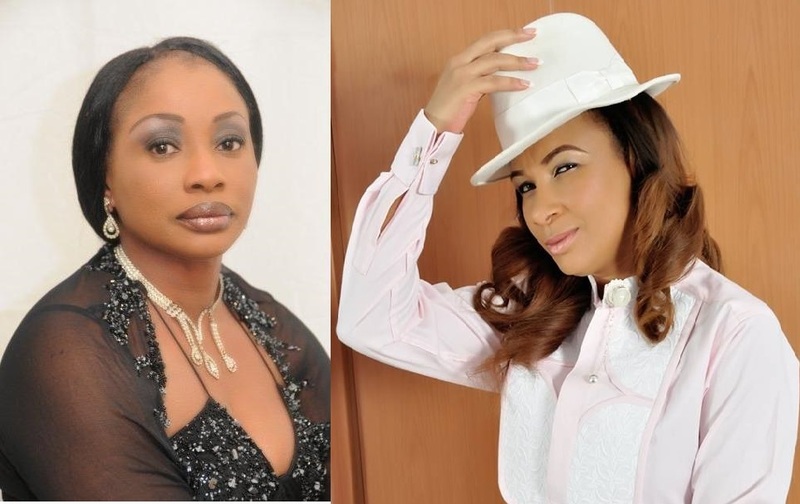 Clarion has been on rampage, saying all sorts about the Actors Guild of Nigerian(AGN) president Ibinabo Fiberesima, and even wrote an open letter to her accusing her of going to Mr president in the name of AGN for political appointment *opens eyes*. If you wanna know if I have been an ardent supporter of Ibinabo’s leadership, just do me a favour and search her name on my Blog, then and only then would you know that I see her as a credible leader and she hasn’t failed. I read and never published madam Clarion’s accusations on my BLOG, cos it’s not worth it at all. I just saw it as mere power tussle and misguided accusations. Why is she fighting IB’s leadership? Who stopped her from going there in the first place? WOMEN always have a way of being cruel to one another, leadership is turn by turn, wait for yours madam Clarion…not this PDP and APC level….lolz. I bring you peace and warm felicitation from the leadership of the Actors Guild of Nigeria (AGN), a Guild that I would like for the purpose of emphasis to re-describe as the only umbrella body for Screen Actors in Nollywood, with a conservative estimate of over five million members spread across 35 states in Nigeria including FCT Abuja. I bring you greetings from the leadership of a Guild that has in the last two years been repositioned as the pride of Nollywood and the foremost Guild in the continent of Africa. I was away on a short vacation when my attention was drawn to two publications (one an open letter and the other an interview) credited to your very respected self, where you cast a lot of aspersions on myself and where you resorted, because of your inordinate ambition to become President of the Guild, to feeding the general public with deceit and falsehood. Ordinarily I would not have replied you openly, because I personally do not join issues with my colleagues- whether junior or senior on the pages of the papers or on social media. Besides, as President, I should be seen to be uniting members and not causing disaffection in the Guild as your unfortunate outburst set out to do. However it is for the purposes of correcting the falsehood and erroneous impression that your very unfortunate and jaundiced views might create in the minds of members of the Guild, stakeholders and the public, that I decided to write to you. But in replying you Ma, I will restrain myself from employing foul words like you did. You are my senior in all respect, and I want to respect that fact, even though I expected that you would have, as someone who claimed in one of the publications that ‘we are close’, reached out to me if you have anything against my person or the office of President of the AGN. Therefore, I will try and stay on the issues you raised and would gloss over some of the petty issues, like my not being qualified to be President of the AGN and I ask you, what it takes to be qualified to be President of the AGN? You seem not to be conversant with the constitution of the Guild you aspire to lead. For your information, I am a graduate and have been an active, financial and card-carrying member of the guild. I even rose from being a Rivers state Chairman of the AGN to becoming the National President. Besides, I have put in close to a decade and half as an actress and have even funded productions in Nollywood. So, I wonder what else I need to qualify me to be elected as President of the AGN. Having said that, If one thing has become clear about your intentions, it is that you are just being hysterical and you have decided to raise the specter of ‘politrickal’ divide to prepare the way for your next course of action- which is to assume headship of the guild. And I ask, which Guild? The same AGN that you openly declared was non-existent or the one you allegedly hurried to register with, few days ago, just because you intend to contest as President? But you didn’t need to go that far Ma. I am very accessible. Members of the Guild can attest to that. If you truly mean well and had all those great ideas to share, all you would have done was to avail yourself of the various platforms available in the guild to call me to order or even when we met face to face. Better still you would have even sent for me, those who know me, know that I would have honoured the call knowing how much I value the contribution and support of time tested professionals like you in our quest to move the guild to greater heights. But you didn’t do any of these. Instead you decided to engage in a macabre dance and I have sworn never to clap for you. The reason I am writing you is simply because I want to set you records straight or that my silence means consent. Madam, I gleaned from your incoherent attacks that your grouse with me was that I didn’t ask President Goodluck Ebele Jonathan for support on issue of legislation that, quoting you now ‘’could bring all the screen actors in Nigeria under one single body so that an enabling environment could be put in place for casting agencies for jobs for actors’’. Your other grouse was that I also asked for ‘a political appointment’ (did you say ‘a political appointment’) and a national secretariat in Abuja. You were also bellyaching because you said I led a delegation that didn’t include veterans. Thankfully you commended me for succeeding, quoting you now, ‘’in a very commendable field which is accessing an appointment to see the President of the Federal Republic of Nigeria at a time like this when the President is engaged in all fronts’’. I thank you for at least recognizing that we were the ones who sought audience with Mr. President and not that we went there by some arrangement, I mean like what used to obtain. But Madam, I am not sure you listened to my address to Mr. President. You mischievously picked on aspect of the entire address that you wanted to use to score your cheap political points and left out the thrust of my address to Mr. President. For the purpose of clarity, I don’t know whether those who reported the visit to you told you that I mentioned to Mr. President in clear terms that my ultimate objective as President of the guild is to deliver better professional and financial opportunities for my members, provide for their long-term welfare (as the acting career can be a precarious one), source support in the areas of finance, funding, provision of standard production equipment for use by our members and the corresponding training facilities and also improve the livelihoods of our actors whilst making the future of our industry more sustainable. I don’t know whether the misguided and disgruntled elements that I suspect are fanning the embers of hate between us and who like a member of my EXCO suggested, are beating the wrong rhythms for you to dance to, mentioned to you that I told Mr. President unequivocally that we have found it difficult to make any headway as a guild and an industry because of lack of adequate legislation, scanty public funding policies and professional training and the near lack of production infrastructure and distribution mechanism? Did they mention to you that I told Mr. President that piracy has prevented the industry from reaching its full economic potential and that one of the focus of the visit to Aso Villa is get Mr. President to direct the enactment of a legislation that will enable actors who play a very significant role in bringing a script to screen, derive tangible benefits from their work and enough security to envisage making a living from it? Did you hear that I complained about the dire need of a modern and responsive legal environment that will guarantee social and intellectual property rights for members and the entire industry? Were you also told that I complained about the inadequacies of our copyright act and the insufficiency of the criminal sanctions for piracy and other copyright infringements and that I urged a comprehensive reform of our copyright system so that producers can continue to remain in business and that way we can create more jobs for our members? Were you also informed that I asked Mr. President to direct the relevant government agencies to negotiate and sign the countless co-production treaties that exist between Nigeria and several countries for the benefit of our members and the Nigerian motion picture industry? May be you don’t know that our inability as an industry to sign co-production treaties is the invisible ceiling that has hindered and ordered the structured international development of the film industry and the subsequent loss of potential Foreign Direct Investment and its positive impact on job creation. Most of our members cannot work outside of our shores because of the lack of production treaties. Even when they work, to secure work permit is difficult. I wonder why they also forgot to mention to you that I implored Mr. President to see to the full implementation of the revised National Film Policy (NFP) and to present the bill on the setting up of the Motion Picture Practitioners Council of Nigeria (MOPPICON) as an Executive bill that should speedily be passed into law. You talked about us asking for a legislation that will compel all actors to come under one umbrella, but wouldn’t it be appropriate to use the opportunity of that august visit to Mr. President to ask that we have a common body that will regulate the motion picture practice in the country and that way help in addressing some of the industry’s structural deficiencies? I have heard you argue about the AGN transforming into a union. We have explored that and we are constantly reminded that we cannot become a union because of certain structural deficiencies in the industry which is why we are hoping that with MOPPICON that will be backed by law, the AGN will have a seat in council and that way we can seek to: negotiate and enforce collective bargaining agreements that establish equitable levels of compensation, benefits, and working conditions for our members. Then too, we will be able to like our counterpart in America- The Screen Actors Guild, collect compensation for exploitation of recorded performances of our members, and provide protection against unauthorized use of those performances; and preserve and expand work opportunities for its members. All that plan is in progress ma, but how would you know if all some of you want to do is to be arm chair members. I raised all of these issues in my speech. But you didn’t even acknowledge them, instead you gave the impression that all I went to the villa to do was to ask for an office for the guild and to ask to be given a political appointment. And I ask, what is wrong in asking for an office for the Guild in the country’s capital territory? As an affiliate of the Federation of International Actors (FIA), wouldn’t it be more prestigious to receive our international visitors in a befitting secretariat that is in the seat of government? I understand the point you make about my not taking ‘veterans’ on the delegation. Oh you wanted to be on the delegation, right? But how can you possibly be on the delegation when you have blatantly refused to identify with the guild. My Exco and I, have tried as much we can to get those of you in the veteran class involved in the activities of the guild. We even created a veteran forum since some of you complained that you would not like to be holding meetings with those some of you consider ‘up starts’ and ‘interlopers’ but each time we call a meeting either directly or indirectly only very few people show up. But we won’t relent. We shall continue to reach out to those of you in that class. And to correct you ma, I didn’t ask Mr. President for ‘a political appointment’ as you have been mouthing. I thanked Mr. President for the few consideration he has made in appointing some practitioners into key government positions and requested for more of such appointments in line with our expressed desire to have more of our creative people in government and in politics so we can be able to have people that will influence legislation that will be for the betterment of the industry. I have attended meetings where most people in government think that all we are good for is beauty and glamour and no brain. So what is wrong in asking that our members be given the opportunity to contribute their quota to national development? What is wrong in asking that someone as experienced as you heads an agency like the Film Corporation so you can bring about the change we desire? You also asked that I resign my appointment as President of the AGN because Mr. President graciously appointed me to serve on the Governing Board of the National Council of Arts and Culture (NCAC). Well it may interest you to note that the appointment was in my personal capacity and it is a part time appointment as we are only expected to sit four times in a year, maximum. However, It was only a coincidence that the appointment was announced days after the visit to the Villa. But I had been intimated long before the inauguration of the board that I have been nominated to serve on the board of one of the agencies in the Federal Ministry of Culture and Tourism. If the other artistes that have been appointed on merit into part time positions have not stopped acting as it were, why should I resign? AGN is governed by a constitution and not by the words of mouth fashioned to destroy a constituted authority. 3. We commenced for the first time, since the establishment of the guild a Health Management Plan and Insurance Scheme for members. 4. We commenced the first ever veteran’s meeting series across all the six-geo political zones. 5. We have been able to change the skewed perception about the Guild to a more positive and purposeful Actors Guild both to the general public, Government and the Press. 6. We have built a more permanent and sustainable membership Database. 8. We have introduced an inter-ethnic cultural festival (Drama, Dance and Poetry) amongst the state chapters to unite all members. 9. We have introduced lifestyle benefits discount for members on travel, holidays, shops on groceries, restaurants. 10. We are in the process of getting legislation to guide and protect the Actors in Nigeria. 11. We are in talks with NBC and Nigerian copyright Commission on residual payments to Actors in Nigeria. 12. We also are in talks with other Guilds and Associations in the industry on the need to unionize. 17. We successfully conducted elections in State chapters that are due. 19. We purchased a brand new HDV camera and accessories for the Guild to support productions of state chapters as well as members. 20. We hosted one of our esteemed members, Omotola Jalade Ekeinde for her achievements especially being listed as one of the 100 Most Influential People in the World. 22. We have produced new Visa identity cards for members. 23. We commenced periodic skills improvement training across the geo political zones starting from South and North central. 25. As a result of her presentation, the AGN President was invited to Ghana by the Hon. Minister of Culture, Tourism and Arts to help fine-tune her presentation to the Parliament. 26. ECOWAS Ministers of Culture also adopted her paper to be included the in the draft recommendation for the rights and welfare of the Actor as recommended in Beijing Treaty and to be ratified by ECOWAS member Nations. 27. We have applied for Project Nollywood training fund to build capacity in the Guild. 28. We also requested for fund for film production from the production unit of the same project. 30. We have completed research on setting up of AGN resource centre and a library for members and researchers. 31. We have just drafted compressive contract and are discussing with producers on the implementation. 32. Held a National Congress successfully in Minna, Niger State on 13th – 15th December 2013. This entry was posted in Entertainment, Fashion trends and tagged AGN President Ibinabo Fiberesima Replies Actress Clarion Chukwura, At Last.